From age seven, I went to Shodo School and received the highest rank before learning from a professional Water Painting artist in high school – which I later then eceived the highest rank for as well. 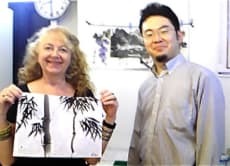 As a Japanese ambassador in British Columbia, Canada, I have represented Japan and have taught water painting in Vancouver as a cultural ambassador. 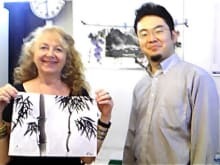 I have also received numerous awards in Japan and abroad at Public Calligraphy Galleries. Satoshi is a great teacher! His technique in sumie (japanese brush for watercolor) is amazing. He's patient, helps you practice a lot and lead us to create a beautiful painting at the end of the class.